At Meadowbrook Golf Club we realise how it can be a bit expensive as a younger person to be a member of a golf club. And that maybe you don’t always have the time to play in competitions. That’s why we have developed our brand new Intermediate Membership. It offers a price that you can afford with the benefits that suit you.Designed for 18 – 34 year olds with limited time but still wish to maintain a club membership. 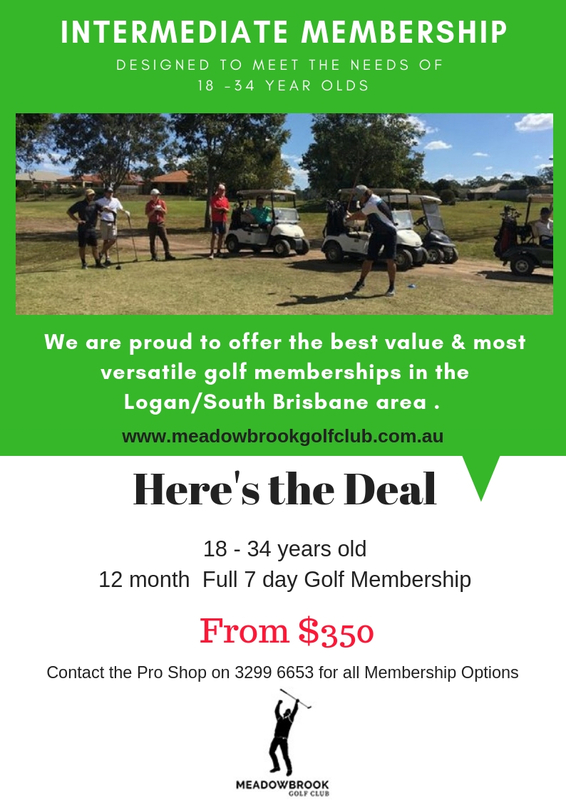 We are proud to offer the best value & most versatile golf memberships in the Logan/South Brisbane area . All intermediate members are entitled to play in 20 club competitions per year, have access to clubhouse facilities, maintain a Golf Australia handicap by paying affiliation fees . We keep members & guests up to date on our website including a members only area, via regular e – newsletters & on various social media. Booking golf can also been done easily online or through the pro shop . We regularly invite members to attend special restaurant events & members only golf events. This membership is designed to create value and flexibility for an individuals aged between 18 and 34 years as a stepping stone to a full individual membership. Need a New set of Clubs as well? Add a set of Cleveland Golf Clubs to your membership using our Cleveland Golf Clubs Membership Deal. If members are wanting an official golf union handicap in order to play in club / district competitions an additional $69 affiliation fee will be charged for Golf Australia & South East Queensland District Golf Association purposes.